Alberto Ascari was a man in a hurry. In a relatively short Grand Prix career between 1948 and 1955, he became Formula One World Champion in 1952 and 1953, winning nine consecutive races on his way to the 1952 title. 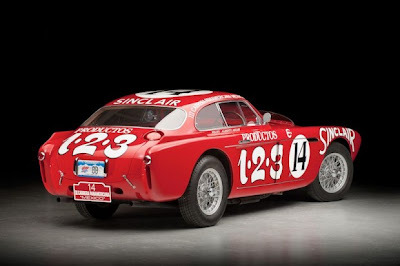 Ascari also finished second in Mexico’s La Carrera Panamericana in 1951, teamed with Luigi Villoresi in the second of two factory Ferrari 212 Inter Berlinettas. After eight stages totaling 2,096 miles, on road conditions best described as wretched, the pair were only eight minutes behind winners Piero Taruffi and Luigi Chinetti. Ferrari had achieved a one-two finish, ahead of 33 American sedans, with varying degrees of factory support. 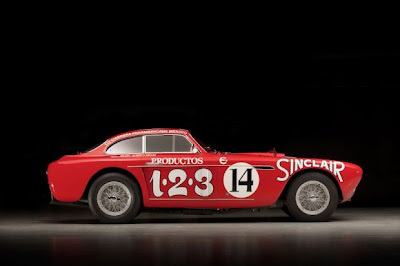 Clearly, 1952 was going to be a factory fight to the finish, and Ferrari built four cars specifically for the event. 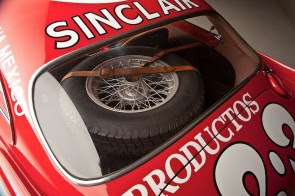 That year, the race was divided into sports and stock classes, with 26 cars entered in the European sports-car category. Mercedes would bring two 300 SL Gullwing coupes and a roadster, and there were entries from Jaguar, Gordini, Lancia and Porsche. The factory Ferraris were named “Mexico” for the event. 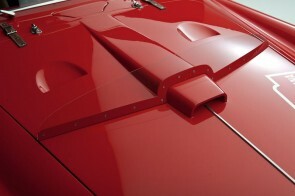 Designed by Giovanni Michelotti for Vignale, the 77.5-inch hood was one of the longest ever to grace a Ferrari, while the unique fenders extended beyond the oval grille in what is one of the most wildly attractive Vignale designs to date. 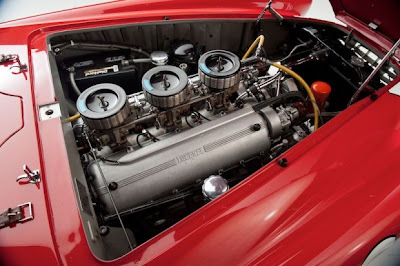 Built as lightweight “340 America models,” with a small-diameter Tuboscossia chassis, the cars were powered by the Lampredi-designed, 4.1-liter, V-12. With 280 horsepower on tap, the Mexicos were capable of 0-60 mph in six seconds and had a top speed of 174 mph – extraordinary performance both then and now. Enzo Ferrari pinned his hopes on Alberto Ascari/Giuseppi Scotuzzi, Franco Cornacchia/Luigi Villoresi and Luigi Chinetti/Jean Lucas, who represented Ferrari’s American operation. Giovanni Bracco was entered in a lighter 250 MM Berlinetta and very nearly pulled off a win. 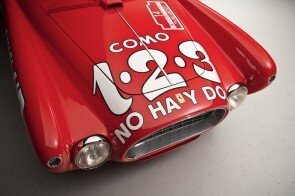 A 340 Mexico Barchetta roadster was entered for American Bill Spear, but he did not start. Designed by Giovanni Michelotti for Vignale, the 77.5-inch hood was one of the longest ever to grace a Ferrari, while the unique fenders extended beyond the oval grille in what is one of the most wildly attractive Vignale designs to date. 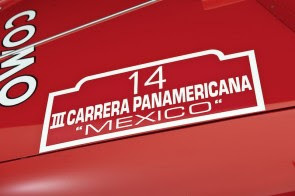 The Mexico Berlinetta presented here – s/n 0226 AT – is remarkable for its matching-numbers originality and the comprehensive provenance that accompanies it. 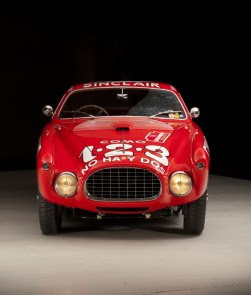 S/n 0226 AT was originally sold by Luigi Chinetti to Allen Guibertson of Dallas, Texas for the princely sum of $14,500. Chinetti also arranged for Ferrari team drivers Ascari and Scotuzzi to race the car in the 1952 Carrera Panamericana. The intensely competitive Ascari had been a runner-up the year before and had already disobeyed team orders to make certain of his first Formula One World Championship. He was a fiercely competitive and highly talented driver, to say the least. “50 miles out (from the start), just over the first series of hills, the road wound down into a valley, across three narrow bridges, then back up into the hills. A blinding blanket of fog lay over the valley and it was here that we awaited the racing pack. “At 7.25 a.m. the first car could be heard, as it screamed through the turns and down into the soup, hit the first, second and last wooden bridge with a deep rumble and disappeared. The fog was so thick that only by standing on the edge of the road and straining hard could the first car be distinguished – a Mercedes. The pace was clearly fast and furious. In a race that claimed more lives than would be acceptable by any modern standards, Ascari passed nine competitors at blistering speeds before his race came to an end prematurely as he lost control over loose stones and collided with a rocky ledge. With John Fitch disqualified in his Mercedes, the Chinetti/Jean Lucas Ferrari Mexico salvaged third place for Ferrari, while Jack McAfee finished fifth and Phil Hill and Arnold Stubbs were sixth. In all, there were only 39 finishers from 92 starters. Ascari’s car, s/n 0226 AT, was shipped back to Ferrari and Vignale for repairs, then returned to Guibertson in Dallas in the spring of 1953. Guibertson sold it to A.V. Dayton, who entered it in the July 4th SCCA race at Offut Air Force Base in Omaha, Nebraska, driven by Carroll Shelby and Jack McAfee, who finished second. Just one year old, 0226 AT had already been driven by some of the greatest international racing legends in the world. On October 25, Dayton entered the car in the Sowega SCCA races in Atlanta, Georgia, where, driven by a Mr. Duncan, it was sidelined by electrical problems. Dayton sold the car back to Chinetti before the end of the year. Throughout the rest of the decades, 0226 AT traded hands between several known owners on the East Coast and in Detroit until 1958, when Richard Londergran showed the car at the 1958 Detroit Auto Show. The following year he sold it to General Motors designer and Ferrari Club of America co-founder Larry Nicklin of Indiana. Mr. Nicklin is well known to enthusiasts as he subsequently also owned chassis 0224 AT, one of the two sister cars to this car. 0226 AT, however, was one of the two Mexicos he owned. Years earlier, as a student in California, he saw such a car pictured in a magazine. As only three cars were ever built, it was surely unlikely he’d ever bump into one accidentally. But that’s precisely what happened – years later, while driving down the famed Woodward Avenue in Detroit, he spotted distinctive fenders poking out of a garage. As luck would have it, this 340 Mexico was 0226 AT. The talented young car designer acquired the car almost immediately and enjoyed it for about a decade, before parting with it to Art Jacobs of Mineola, New York in 1969. Jacobs kept the Berlinetta for only one year before passing it on to Theodore Pratt in New York City. There it stayed for five years until bought by David Carroll of Boston, Massachusetts, who would keep it for another ten years. When Carroll did sell s/n 0226 AT in 1985, it was due for some work. 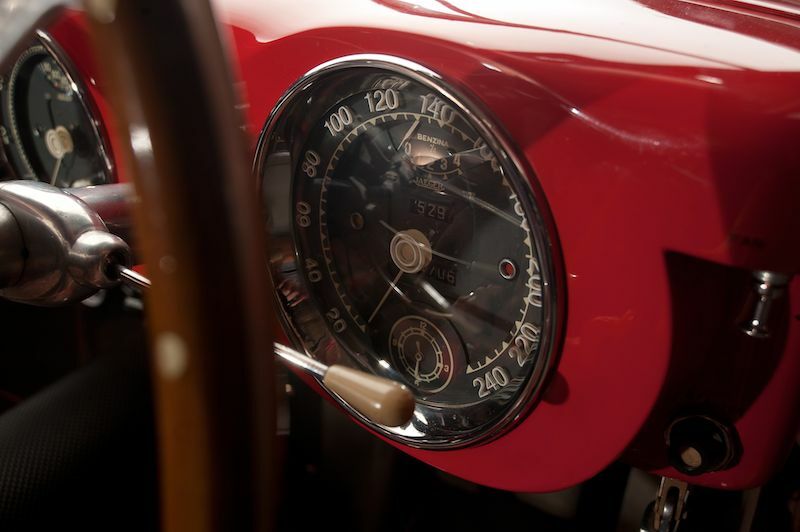 New owner and prominent Ferrari collector J. Willard Marriott Jr. of Chevy Chase, Maryland commissioned a ground-up, three-year restoration by David Carte and Skip Hunt. 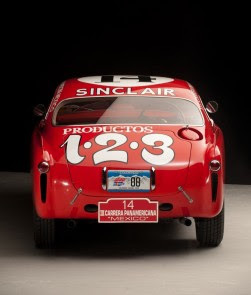 Having restored s/n 0226 AT to its correct 1952 Carrera Panamericana specifications and livery, Marriott set out on the concours circuit in 1988. He was immediately successful, winning Best of Show at the 1988 Ferrari Club of America’s Concours at Elkhart Lake, Wisconsin and also the Phil Hill Award for Best Competition Car. He collected the Honorary Chairman Award at the Ferrari National Meet at Lake Lanier Island, Georgia in 1989 and followed that with the Peter Helck Award for Best Race Car at the Meadow Brook Concours d’Elegance in Michigan. Marriott wrapped up the year with a Best in Class at the Pebble Beach Concours d’Elegance in Monterey, California. Without exaggeration, these awards constitute some of the most desirable honors the car could have secured in the late 1980s. Distinction at Pebble Beach and Meadow Brook certainly speaks for itself, but winning Best of Show at an FCA event signifies very positive recognition from the largest Ferrari club in the world. Such was the outstanding quality of this 340 Mexico. After this, Marriott enjoyed s/n 0226 AT for almost 10 years, until he sold it to Carlos Monteverde in London in November 1997. Monteverde owned the Berlinetta for two years, selling it to the current owner in 1999, who like the preceding caretakers, is a prominent collector of the finest GT and racing machinery. Since that time, 0226 AT has been back at home in competition, participating twice in the Colorado Grand (2001 and 2007) and competing energetically in the Monterey Historic Races at Laguna Seca in 2002, 2005 and 2006. 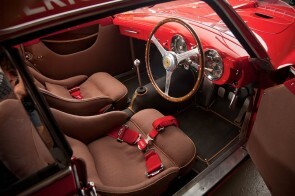 In 2007, the car was shown at the Pebble Beach Concours d’Elegance in the Ferrari Competition class for exhibition only. This featured 1952 Ferrari 340 Mexico Berlinetta, chassis number 0226 AT, will be offered for sale at the RM Auctions Monterey auction, scheduled for August 19-20, 2011 at the Portola Hotel in Monterey, California. 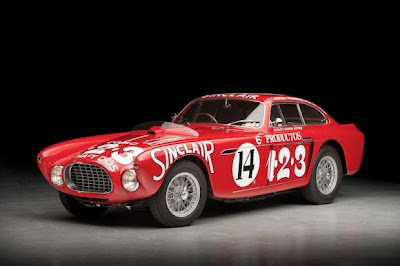 With only three Ferrari 340 Mexico Berlinettas built, this aggressive Vignale coupe would be welcome at events anywhere, be it the Mille Miglia Storica or any concours event around the world. Nice story, I didn't know Carol Shelby drove a Ferrari I thought he hated them.